Let’s play a game of doppelgänger intros – 80s edition. I always have a moment of exquisite confusion when this comes on in a club – which admittedly hasn’t happened in a long time – is it going to be Maniac by Michael Sembello or Gambler by Madonna? Whichever it turns out to be, I end up leaving the dancefloor because the pair of them are far too fast to dance to unless you happen to be Jennifer Beals. Of course the other great twin intros are We Don’t Have to Take Our Clothes Off by the late great Jermaine Stewart and How Will I Know by the later, greater Whitney Houston. Identical. Anyway, it’s Maniac we’re here to talk about, so let’s have a listen. Caution: video contains absurd amounts of flashing strobe lights. Simultaneously fabulous and exhausting, Maniac was a single from the all-conquering Flashdance soundtrack and in the film it accompanied a frenetic montage scene, which Geri Halliwell later nicked paid homage to in the video for her knock-off affectionate cover of It’s Raining Men. It spent a well-deserved two weeks atop the Billboard Hot 100 in September 1983, but despite spending 8 weeks on the UK chart, it could only crawl to no.43. I suspect the main reason for this was that its predecessor, Flashdance…What a Feeling by Irene Cara simply refused to die, either at radio or on the singles wall in Woolworths. Poor Michael was left to languish and became something of a bargain-bin staple. 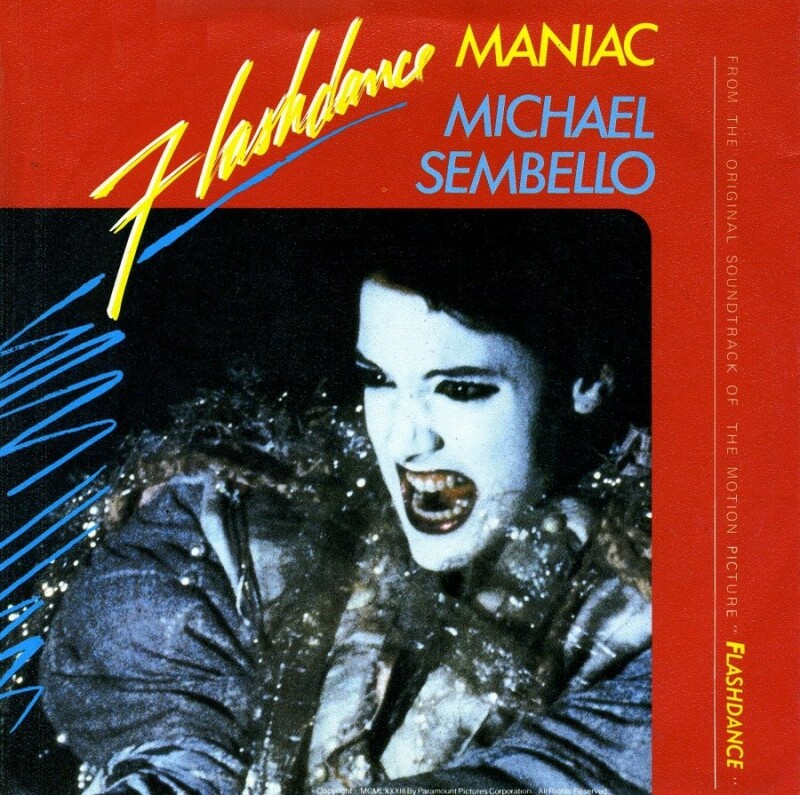 I’d like to say he had the last laugh, but Maniac was to remain the pinnacle of Sembello’s chart career, and he was sadly unable to repeat the trick with songs from Gremlins and Cocoon. But they say one self-penned smash hit is all you need (is this actually true, anybody know?) so hopefully he’s been living off those royalties quite comfortably ever since. Who could sing this today and have a hit? I’ve been waiting years for someone to re-interpret this as a painfully slow acoustic ballad. So maybe Ed Sheeran could nip into the Live Lounge and have a go.